Northwest Pinball and Arcade Show (NWPAS) provides competitive pinball players in the Pacific Northwest a high quality pinball tournament experience, that begins with the satellite series, and ends with several major events at the show, including the prestigious NW Women's Pinball Championship, a uniquely designed Open Match Play Tournament, and the nation's best attended PinGolf event. This page provides a summary of the NWPAS tournament schedule and summary of each tournament at the show, Friday May 31 through Sunday June 2, 2019. NOTE: Registration Closes 15 minutes prior to round start, or earlier if a round fills up. Registration generally opens a few hours before a round; see individual tournament page for when registration opens for any particular round. Free Practice: Any Tourney Bank machine ready for play, Fri Noon-1:00pm. Maximum 2 minutes per machine. Open Match Play Qualifying Rounds: A: Fri 1:15pm-4:15pm, B: Fri 8:15pm-11:15pm, C: Sat 10:15am-1:15pm, D: Sat 4:30pm-7:30pm, E on Classics: Sat 8:00pm-11:00pm. Classic PinGolf Tee-Off Times:Fri 1:10pm-10:05pm, Sat 10:10am-2:45pm. Plan 1½ hours to complete course. Here is a summary of the events at the show. Click on tournament for details of that specific tournament. 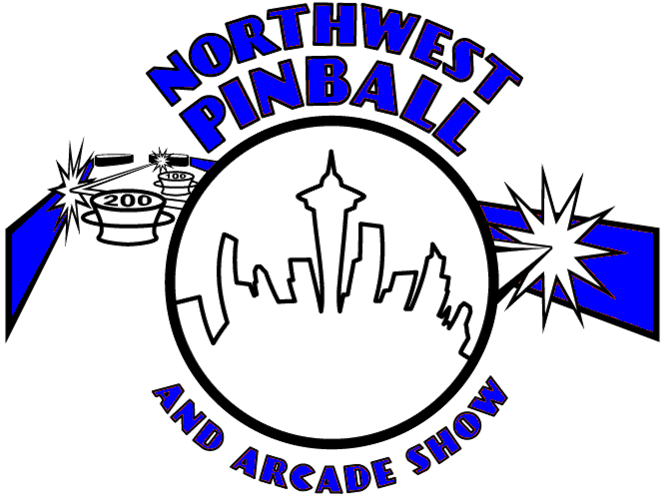 NWPAS is please to once again host the Northwest Women's Pinball Championship! For each of the last three years, it was the largest women's pinball tournament in the world, with players attending from Washington, Oregon, British Columbia, Colorado, California, and New York! This year, a New TBD Machine, sponsored by Nitro Pinball, is the top prize! Two qualifying rounds, one on Friday, other on Saturday. Women who play in the Friday round but don't qualify may try again in the Saturday round if round does not fill up with new players. Woman who don't play in Friday round have priority to register for the Saturday round. Winner of this tournament wins a TBD Pinball Machine! $500 for 2nd place! The Open Match Play tournament with its unique qualifying and bonus scoring format was the second largest match play tournament in the nation for several years in a row, second only to Pinburgh, the world's largest tournament. 35 players participate in the playoffs on Sunday, earning their way by finishing in the top 7 of one of the five qualifying rounds. This is the main pinball tournament of the event, offering IFPA World Pinball Player Ranking (WPPR) points at 100% grading. This event is open to all. $30 entry, maximum two retries allowed, qualifying at specific times on Friday and Saturday, playoffs on Sunday. $1000 for A division winner! Trophy or plaque for top 3 finishers. $250 for B-Division winner. Check the Monday Night Pinball / NWPAS Player Search Page if you're currently eligible for B division. Any player who has an Individual Player Rating (IPR) of 5 or less is eligible for both A and B division prizes. Players with an IPR of 6 are only eligible for A division prizes. The Classic PinGolf event is one of the largest in the nation. This popular format returns to NWPAS 2019! This is another IFPA-ranked tournament that will be run on a variety of pre-Dot-Matrix Pinball machines. $30 entry fee for one round of PinGolf. $500 prize for winner; with trophy or plaque for top 3 finishers. Top 28 players make it to a five-strike fair-strike 4-player knockout, PinGolf style. Casual Match Play tournament on Sunday for players who are relatively new to competitive pinball or have limited experience in tournaments. Tournament is restricted to players with an Individual Player Rating (IPR) of 3 or less. Check the Monday Night Pinball / NWPAS Player Search Page to determine your IPR. $150 prize for winner; $100 for 2nd place. Plaques for top 4 finishers. Look for details at the show for tournaments that cater to kids 12-years old and younger. To be announced a few weeks prior to the show.  The first tie-breaker for all match play will be number of 7-point wins, then 6-point wins, then 5-point, and so on.  For critical tie-breakers only, the second tie-breaker will be points earned in the last game played, then before-last, then before that back to the first game.  For non-critical tie-breakers (for seeding only), ties will be broken randomly.  A one-ball tie-breaking game on a randomly selected machine will be used only for critical tie-breakers when the above second tie breakers fail to break a tie. Eligibility as A, B, or Rookie/Amateur will now be done via Individual Player Rating (IPR), as originated by Seattle Monday Night Pinball (MNP). These combine IFPA WPPR with Matchplay.event ratings into a simple rating between 1 and 6 for each player.  A player with an IPR of 6 is restricted to A-division. This applies to the Open Match Play tournament and the NWPAS Satellite Tournaments that have an IPR restriction.  A player with an IPR of 3 or lower is eligible for the Rookie/Amateur tournament, as well as the Rookie/Amateur guaranteed prizes at each NWPAS Satellite Tournaments.  IPRs are updated about once every six weeks, then frozen until the next update. The IPRs frozen at the time of an event will be the ones in effect for that event.  The IPRs frozen by mid-May in preparation for MNP playoffs will be the ones used for the events at the main show.  Due to the popularity of the one restricted no-A-division players event held last year, a second such event has been added this year. The tournaments at both Narwhal and Olaf's will be limited such that players with IPR of 6 are not eligible. Due to the restriction, these tournaments will not award IFPA WPPR points.  Every NWPAS Satellite tournament will offer WPPR points except for those that have a restriction such that IFPA does not allow points to be awarded. Back to Northwest Pinball and Arcade Show Home Page.